Brakes applied to Gig Harbor home price slide. The slide of the last five and a half years for Gig Harbor home prices has slowed in the last couple months while dropping 10% for the year. 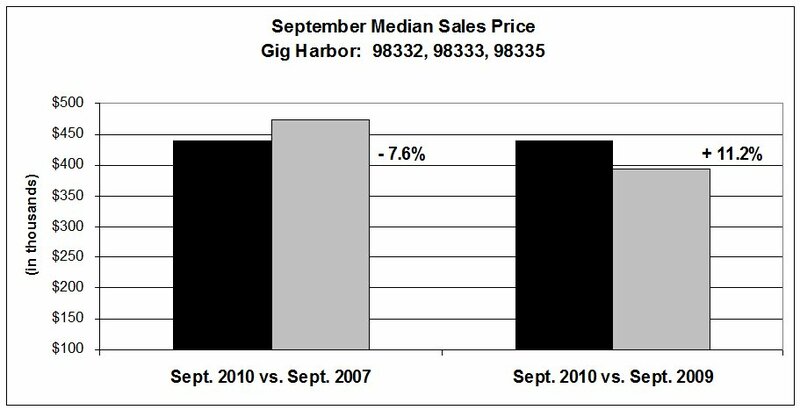 Sales for 2011 shows Gig Harbor home prices(including Fox Island) neither bank-owned or short sales in the 4th quarter declined only 3% rather than the 17% drop experienced in third quarter. Local 2011 quarterly statistics for Gig Harbor home prices highlight the difference between heavily discounted bank-owned houses and the “rest of the market”. REO sales represented 28% of all home sales in the first quarter but only 18-19% the last half of the year. This is expected to increase again as the lenders begin to ratchet up foreclosures after last week’s settlement with the five largest lenders, pertaining to sloppy methodology including robo-signing of documents. 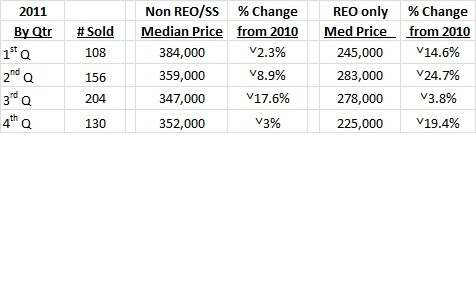 REO sales are still expected to maintain a solid presence in the housing market the balance of this year. Nation-wide foreclosures decreased 34% last year over 2010…but are expected to increase 25% in 2012. Short sales are not separated out in the table above because they actually do not affect the overall median price much. They are spread throughout all prices and tend to settle closer to the non-distressed market price. In fact the fourth quarter saw short sales close higher than non-distressed sales and much higher than the year before. 2011 is the year lenders have become receptive to the process, along with the help of negotiators who specialize in short sales. The monthly national data shows some stabilization or increases in select markets one month while the next month produces data showing nearly all metropolitan areas are still down. Bright spots in the Puget Sound are the hiring Boeing and its contractors are doing plus overall improvement in employment. Smaller inventory, combined with historically low rates is the traditional mix for a market rebound. It isn’t housing itself that is dragging prices down but buyers’ hesitancy with lack of jobs, the stalemate in DC, volatile global economic issues and the stock market. Unfortunately these factors are producing some of the following statistics for Gig Harbor home sales. There’s not much good news for Gig Harbor home sales in these facts. I’ve used the last 12 month average compared the 12 months prior. This tends to even out the monthly highs and lows. Our South Kitsap neighbors haven’t seen the same price slide—down just 2.9% as a comparison. The market there has been gaining strength all year, but they experienced an even higher rate—43%–of sales from the distressed arena with 25% of active listings either bank-owned or short sale. And King and Thurston counties are down just 8% and 5.25% respectively with Thurston having less than a two month inventory. It was about a year ago that forecasters warned prices would slip another 10% nationally. No one wanted to believe it. But Gig Harbor is now down about 40% from the peak in summer 2006. The “supply and demand” theory is working well for bank-owned properties. There was one buyer for every two homes listed in October. This demand contributes to the price depression. Meanwhile a shorter supply of bank-owned properties could bode well for non-distressed sellers and maybe a settling of prices for a short time. This may change as more foreclosed properties are marketed for sale. To put perspective on the price declines for ALL sales versus those not distressed I have used second quarter figures which showed a year-over-year decline of 14% for all sales in Gig Harbor. Non-distressed homes showed a 12% decline, short sales a 9% drop and bank-owned 18%. It is easy to see when bank-owned sales represent 25% of the market (in April as high as 42%) it will draw down the overall figures. But even those non-distressed homes suffer because of the competition. Investors have come back to buy and they buy in the more affordable price ranges, adding to the downward push of median prices for Gig Harbor home sales. Carole is a Broker at Windermere Real Estate in Gig Harbor, licensed since 1967. She may be reached at 253.549.6611 or Carole@ISellGigHarbor.com. 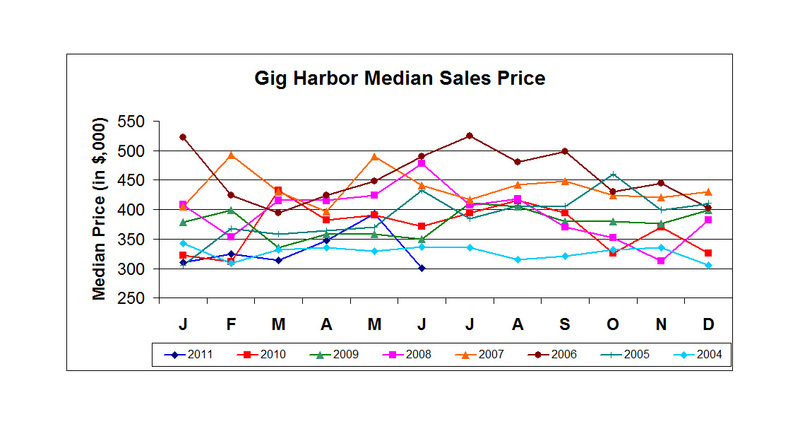 Gig Harbor home prices drop to 2004 levels for the first four months of this year. Prices have clearly not stablized. The 15.4% drop from the same time last year is typical of Pierce county as a whole. The Gig Harbor peninsula and Fox Island make up the data for Gig Harbor home prices. April showed improvement, posting the highest median sales figure since November. And the lower inventory is pulling down the supply of homes. Distressed home sales–mostly bank-owned–represent roughly a third or more of all sales currently. This is applying downward pressure on Gig Harbor home prices. this figure is slightly higher than nationally reported data. Zillow reported last week that house prices are falling at their fastest rate in over three years. Zillow predicts the market will not bottom nationally until 2012…something no Gig Harbor real estate professional will agrue with. For buyers–it is great time to buy–mortgages are cheap and bank-owned deals are plentiful. Carole Holmaas is a Broker at Windermere Real Estate, licensed since 1967. Gig Harbor home prices have clearly not yet stabilized as April data shows prices down 15.4% for the last three-month period from a year ago…but up from March. This $348,000 figure is the highest since November and uses the median sales price (half the sales above and half below). Overall, Gig Harbor home prices are down 5.7% in the last one year compared to the one year period prior. The Gig Harbor peninsula and Fox Island are included in data for Gig Harbor home prices. Sales volume is right in line with last April and year-to-date figures—and the best since 2007. Inventory is down nearly 20% from a year ago with an 11 months supply of homes on the market. This drop of listings correlates closely with the rest of the Puget Sound. Buyers in select price ranges may want to monitor that closely as a few areas have become seller’s markets. The $200-250,000 range has only a four month supply and a couple mid to high-end ranges are in a balanced market condition. Seattle Realtors are reporting they believe the bottom has been reached in that area’s homes priced under $350,000 and with a slimmer supply of good listings some upward pressure is being applied to home prices there. Gig Harbor home prices typically follow suit. But sales above $800,000 have retrenched deeply in the past couple months as the economy has stumbled with only one closing in April—for $2.1m—a deal that started as early as January. Distressed home sales—mostly bank-owned– represented a slightly smaller part of April’s closings—36% compared to 42% in March. It is easy to see the downward pressure on Gig Harbor home prices with only 6% of listed homes bank-owned but 31% of all sales bank-owned properties. Currently the national figure is about 30% of sales. Gig Harbor’s figures have continued to creep up over the past year. According to the Case-Shiller Index, the Seattle/Bellevue/Everett area has about a 12.9 month supply of distressed homes to purge. This represents the “shadow inventory” of homes in varying stages of delinquency and foreclosure as well as listed homes. Carole Holmaas is a Managing Broker at Windermere Real Estate specializing in waterfront and view properties. She has been licensed since 1967. She maybe reached at 253.549.6611 or Carole@ISellGigHarbor.com. Median Gig Harbor home prices are up 11.2% from a year ago, to $438,000. Median sales price is the normal method used for trends—half the sales above $438,000 and half below $438,000. This is a better figure than Pierce County, as a whole, which trended downward just slightly in September. These statistics represent the Gig Harbor peninsula, including Fox Island. 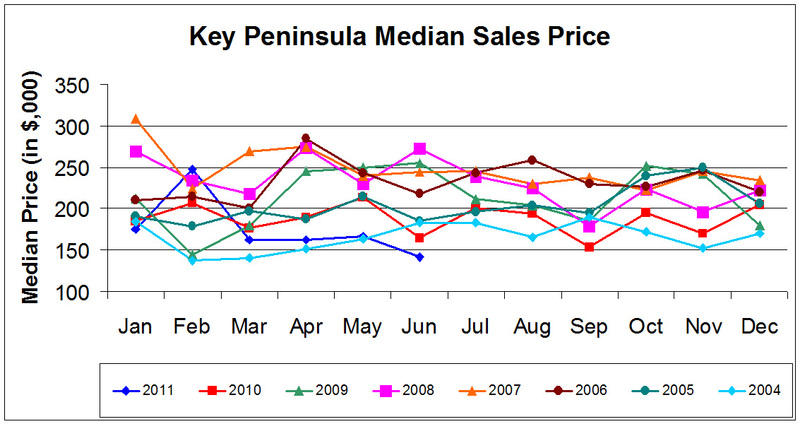 My next blog posting will show what is happening with Key Peninsula home prices. Even more encouraging than the year-over-year figure is Gig Harbor homes prices have trended up 4.3% over the past 12 months compared to the previous 12 months. The third quarter as a whole is also an improvement over both 2009 and 2008. These more comprehensive numbers indicate Gig Harbor home prices are making a gradual but steady climb out of the hole they were in a year ago. The chart shows the specifics of the changes in Gig Harbor home prices. Noteworthy too, September recorded the highest median sales price of any month since June 2008—more than two years ago. Other than the 2008 date one had to look to 2007’s summer months to match or beat this September’s price. Sales ran the gamut—5 in Canterwood, 4 waterfront homes, 4 view homes, 4 condos, 4 in the new Chelsea Park neighborhood. The bulk of sales were in the $450-500,000 and $600-650,000 range, in addition to $250-300,000. Sales volume is still slow—down from 2009 but nearly on a par with 2008—not yet great. There is currently a 13 month supply of houses on the market, based on September’s sales. That’s exactly what it was three years ago—September 2007–when the market turned downward–followed by 16 months often as high as 29 and 35 months supply. A balanced market is between a 5-6 months supply. September’s inventory of active listings is lower than it has been for this time of year. 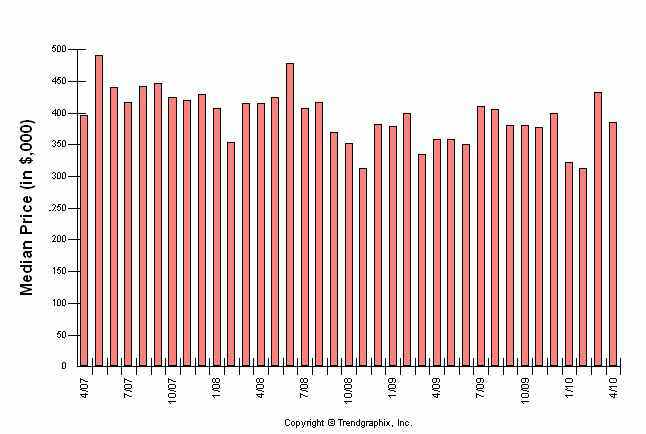 This low inventory might be giving us a false reading if there is a substantial amount of shadow inventory in the Gig Harbor market. Shadow inventory are homes foreclosed on by the lenders but not yet placed on the open market. Carole Holmaas is a Broker, licensed with Windermere Real Estate. She may be reached at 253.549.6611 or carole@ISellGigHarbor.com.